Another highly wearable jumper with a flattering neckline from the 1950's. 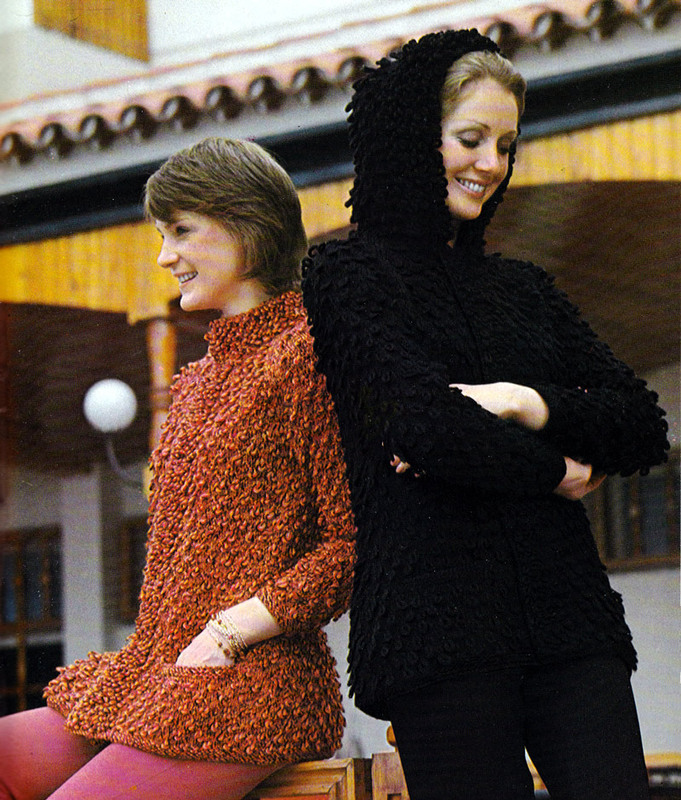 The sleeves look to be a pleasing (to me) three-quarter length but with a set in style that is almost a dolman, yet with a flattering line fitted to the neck shaping. 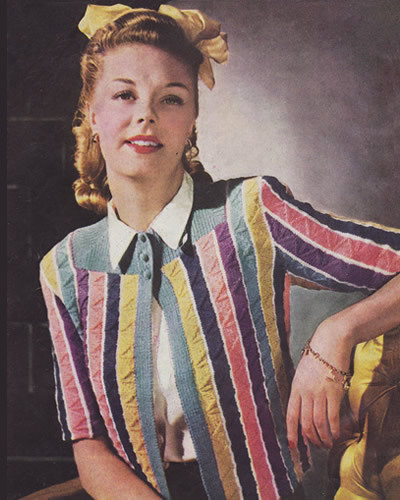 Although cited as a "thickie" in 1950s terms it's made in a standard double knitting weight yarn - so "Spring Thickie" or "Square Neck Casual" - I leave the name up to you. Instructions for the larger size is given in brackets. Where one set of figures is given this applies to both sizes. The sweater is worked in an all-over pattern involving loops and slipped stitches. It is advisable to practise this stitch to get used to it before starting the main work. Take particular care not to drop any stitches as it is difficult to pick them up again without spoiling the pattern. Where numbers of stitches are given these apply to the basic number only, ie each double stitch is counted as one stitch. With No 9 needles, cast on 13 stitches, and work 2 inches to practise the pattern. 1st row: k1 * insert needle into next stitch and knit, winding wool twice round needle; repeat from * to end. last loop on left needle, knit into back of this loop, winding wool twice round needle. The 3rd row forms the pattern and this row is now repeated throughout. Using yarn in main shade and No 9 needles, cast on 101 (109) stitches and work straight in pattern starting with 1st and 2nd rows [once 2nd row is done there are 100 (108) stitches]; continue until 31 (31) ridges have been done from start. 1st loop instead of dropping it, * knit together the next 2 loops forming the double stitch but putting wool round needle once only, then slip the 1st stitch over the 2nd stitch in the usual way; repeat from * until 20 (24) stitches have been cast off], then pattern 60 (60), cast off the last 20 (24) stitches in the same way. With wrong side facing, rejoin wool and continue straight in pattern until 51 (51) ridges have been done from start. Break off main shade yarn, and join in white yarn. 2nd row: In white yarn, k2tog, [p1, k1] 28 times, p1, k2tog. 3rd row: In white yarn, [p1, k1] 29 times, p1. 4th row: In white yarn, p2tog, [k1, p1] 27 times, k1, p2tog. 5th row: In white yarn, [p1, k1] 28 times, p1. Change to No 11 needles and continue in rib with 2 rows main shade, 4 rows white, 2 rows main shade, and 4 rows white, and decreasing at each end of every alternate row. With main shade and No 9 needles, cast on 26 (26) stitches and work about 4 inches in stocking stitch, ending with a purl row. Break off yarn and leave stitches on a spare needle or stitch holder. rows, until 11 (11) ridges have been done from start. Next row (right side facing): pattern 9 (11), leave main shade yarn hanging, and join in white, [knit the next 2 loops together, winding wool once round needle] 26 times, slip these 26 white stitches on a spare needle or stitch holder for the time being; pick up the main shade yarn again and work across the 26 (26) stitches of one pocket lining thus [k1 winding wool twice round needle] 26 times, pattern across the next 30 (34) stitches of main work, again leave main shade yarn hanging, join in 2nd ball of white and work across the next 26 (26) stitches as before and leave on a spare needle or stitch holder; pick up main shade and work across 26 (26) stitches of 2nd pocket lining as before, pattern 9 (11). Continue in pattern until 31 (31) ridges have been done from start, then with right side facing, shape armholes exactly as given for back, then work straight in pattern on the centre 60 (60) stitches until 41 (41) ridges have been done from start. Break off main shade and and join in white. as given for back from ** to **. Using white yarn and No 11 needles, cast on 60 (60) Sts, and work 4 rows k1/p1 rib. Join in main shade and rib 2 rows, then rib 4 rows white , increasing 1 stitch at each end of the last row; rib 2 rows main shade. Change to No 9 needles and rib 3 rows in white. Join in main shade and work first 3 rows of pattern as given for back. Next row: Knit and purl in 1st loop of 1st stitch instead of dropping it, keeping 2nd loop on left needle as before, pattern to end as given for 3rd pattern row. keeping 2nd loop on left needle as before, pattern to last stitch as given for 3rd pattern row, insert left needle into loop of last stitch of previous row, then knit these 2 stitches together, winding wool twice round needle [this gives an increase without leaving a hole]. Work straight until 36 (38) ridges have been done from start. ‡With right side facing shape top. * Next row: Cast off 12 (12) as described before, pattern to last 12 (12) stitches , cast off the last 12 (12) stitches in the same way. With wrong side facing rejoin yarn, and pattern back. off the last 5 (5) stitches. With wrong side facing, rejoin wool and pattern back. [45 (45) stitches remain.]. Join in white and work striped ribbing, shaping as before. Work as for left sleeve from ** to ** [123 (123) sts]. Repeat from ‡ to ‡ once. Next row: Cast off 5 (5) stitches, pattern to last 25 (25) stitches, cast off the last 25 (25) stitches. With wrong side facing, rejoin yarn and pattern back. Join in white and finish as before. Using tailored seams, join side seams. Pin sleeves very carefully into armholes, making sure you have the right sleeve in the right armhole, match the neck ribbing neatly at corners and pin straight edge of sleeve [side edge] to the 20 cast-off stitches at the back and front. Sew in position, then join the rest of the sleeve seam. With No 11 needles and white wool, work a further 3 rows rib across each pocket top, then 2 rows main shade, 3 rows white; cast off in rib in white Catch down sides of pocket tops and pocket linings. 9 (3¾mm) and 11 (3mm) needles. This pattern stitch is difficult to measure but it is equivalent to a basic tension of 23sts x 31 rows to 4 ins in stocking stitch on 3¾mm needles. The pattern is given in two sizes to fit bust: 34-35 (36-37) inches; length from top of shoulders, 23 (23) ins. ; sleeve seam, 14½ (15) ins.